If you’ve ever seen the anime series Psycho-Pass you probably know the high-tech gun called the Dominator. Even if you don’t know the series this real life rendition of the gun is an impressive looking gadget with a ditto price tag. What is this Dominator Gun? The DOMINATOR features authentic voice and sound effects and a fully mechanized Eliminator mode. It’s full of LED lights and features the same owner recognition as in the series (locking out unfamiliar persons). The gun can automatically playback voiceovers depending on the situation, such as grasping the grip, detecting an authorized person and more. It goes quite a bit further than your regular toy gun as this DOMINATOR features a built-in camera that can stream images to the associated smartphone app overlaying Crime Coefficient data over your target. Where can I buy the DOMINATOR gun? The price tag makes this a gift for the true Psycho-Pass fan. You can choose between a regular synthetic resin handle finish or a polished natural rosewood finish. 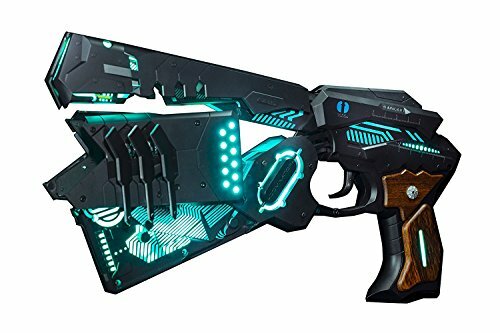 Get the DOMINATOR gun at the Cerevo website (has special prized options for a kit) or on Amazon via the link below.